At the detective’s request, the suspects are gathered in the parlor. The dowager, the duchess, the vicar, the socialite, and the butler exude calm on the surface but squirm with anxiety underneath. After recounting the facts—and revealing that the affair and the stolen diamond were just red herrings—the sleuth points his accusing finger: “You, sir, are the killer!” What happens next depends on the identity of the detective. If Sherlock Holmes, the killer’s motive and method are exposed and explained, and police cart him off. If Professor Layton, this is when the giant robots come out. The dramatic reveal is the moment in a detective story when the gumshoe brings his sword down on a Gordian knot of prejudices, superstitions, and secrets—enabling rationality and justice to triumph. But for the reader, the reveal is also the exact moment when a mystery stops being interesting. Before the sleuth’s accusation, there were infinite possibilities, dozens of suspects with motives and means, and sometimes even potentially supernatural elements at work. After the reveal, though? Turns out the butler did it. But that’s not so when Professor Layton is on the case. In Level-5’s series of whodunits, the solution is always more exciting than the mystery, which allows the player to share in Layton’s love of case cracking. In his inaugural adventure, Professor Layton And The Curious Village, Layton and his protégé, Luke, visit a sleepy English town to investigate the whereabouts and contents of a large inheritance left by a wealthy baron. It’s a classic mystery setup that unfolds in classic mystery style: A tremendous quantity of money is due to change hands, an early murder eliminates a potential heir, and an outsider has come to town to make sense of it all. Once the professor has brandished his accusing digit, the truth finally comes out. The butler did not do it. No, the truth is that the citizens of the town are all riddle-dispensing robots built to ensure that only a beneficiary sufficiently skilled at solving obtuse brainteasers would walk away with the fortune. At the end of the story, Layton, Luke, and the baron’s orphaned daughter leave the town, cheerily unaware that the preceding adventure was utterly bonkers. All genre fiction is bound by rules, but mystery stories are among the most formulaic of all. Raymond Chandler, Ronald Knox, and S.S. Van Dine all tried their hands at codifying the exact laws of detective fiction, and they all agreed on the major points. The reader must be provided all the information necessary to solve the crime themselves. The guilty party must be a character already known to the audience. Supernatural methods of both crime and investigation are strictly forbidden. These rules enable the construction of tight, satisfying mystery yarns, but by design, they allow a savvy reader to deduce the end of almost any story that obeys them. They reduce mysteries to math, and the climactic reveal is the equals sign that connects the formula to the only logical solution that must follow it. Despite the absurd resolution to the story, Curious Village never actually breaks the agreed-upon rules of detective fiction. 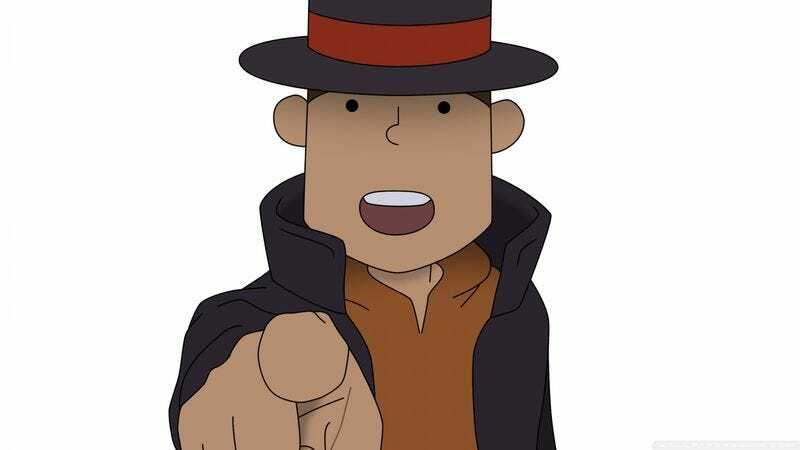 The clues that help Layton reach this preposterous conclusion—clockwork gears found near ostensible corpses, kidnapping victims reappearing with no memory—are never hidden from the audience, theoretically enabling shrewd players to make the same deductions. None of the story’s seemingly inexplicable events are the result of magic or unpredictable paranormal forces. Like any self-respecting mystery, the correct solution in Curious Village is the only one that answers all its questions. Unlike most self-respecting mysteries, the resolution leaves the world seeming more interesting, not less. On paper, a character who exposes injustice and squashes superstition with insight and wit alone is a hero, but it’s difficult to really admire a hero who makes everything they touch more boring. Every time sleuths are able to prove that a ghost ship was an illusion made with mirrors and dry ice or that a seemingly unsolvable locked-room murder was committed with the use of a secret passage, they reveal that life is more mundane than it first appears. Sherlock Holmes, Nancy Drew, even the sleuthing burnouts of Scooby-Doo are private investigators who won’t be stopped until the truth is known and the guilty have been punished. But after the hundredth time that the pirate’s ghost turns out to just be Old Farmer Gaptooth in a rubber mask, it’s difficult to share in their enthusiasm for truth and justice. When Professor Layton proves that ghosts aren’t real, he does it by stumbling on a still-living prehistoric sea monster that goes on to have a climactic battle against a giant robot. If that’s the sort of truth that’s struggling to come out, then lead on, professor.